The Navy’s top admiral ordered the entire fleet Monday to take a one-day “operational pause” to make sure they are running their ships safely a day after the USS John S. McCain collided with an oil tanker off Singapore. Admiral John Richardson gave the order as a search was underway for 10 American sailors assigned to the McCain who were still missing after Sunday’s collision in the Strait of Malacca. 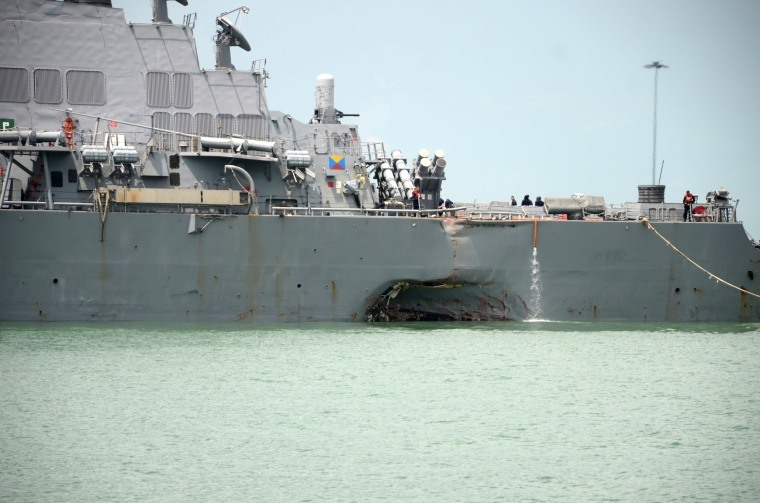 The crash was the second time this year a destroyer based at the 7th Fleet’s home port of Yokosuka, Japan, was involved in a collision at sea — and the fourth mishap this year involving a Navy vessel in the Pacific. Richardson also ordered Admiral Philip Davidson, who leads the Fleet Forces Command in Norfolk, Virginia, to investigate how the Navy trains its forces to operate in the Pacific. “It also will include a review of how we train and certify our surface warfare community, including tactical and navigational proficiency,” he said. Named after the father and grandfather of Arizona Sen. John McCain, the 8,300 ton destroyer had finished patrolling the South China Sea and was heading to Singapore when it collided with the much larger 30,000-ton Alnic MC. The wreck did major damage to the port side of the ship, which was able to limp into port. Seven sailors were killed on June 17 when the USS Fitzgerald crashed into a Philippine merchant ship off the coast of Japan. The ship's commanding officer, executive officer and senior enlisted officer were all relieved of their duties after the Navy concluded “serious mistakes were made by the crew." Before that, the USS Antietam, a guided-missile cruiser, ran aground on Jan. 31 while trying to anchor in Tokyo Bay, Japan. And on May 7, the USS Lake Champlain was struck by a small fishing boat off the Korean Peninsula. It too is a guided-missile cruiser. "We have not had a spate of collisions like this in recent memory," said Jerry Hendrix, a former Navy captain who now works for the Center for a New American Security. "This is abnormal." The narrow, 550-mile stretch of water the McCain was plying "is like a merge lane on the ultimate superhighway," Hendrix said. "One third of the world's ships pass through here," he said. "They should have been aware that they were operating in a very high transit area." Bryan McGrath of the Center for International Maritime Security, who is the former commander of the USS Bulkeley, agreed. "The bottom line is that these incidents, coming as close as they did, means the Navy has got to look whether there are systemic problems," he said.